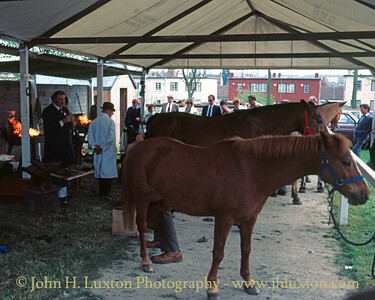 Farriers' Competition - Devon County Show. 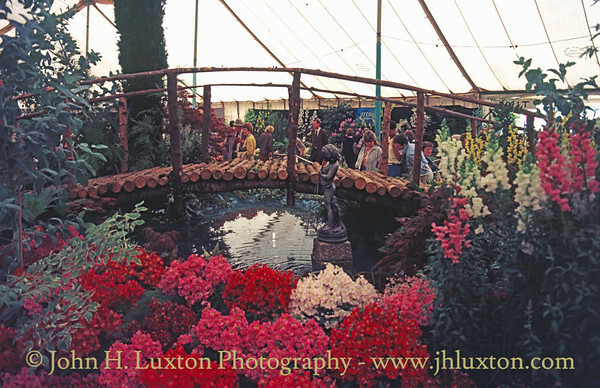 Floral Displays in the flower marquee at the 1985 Devon County Show. 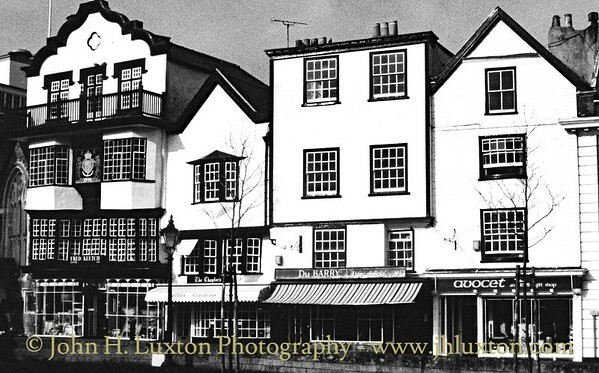 The Turks Head Public House, Guildhall Shopping Centre, Exeter. 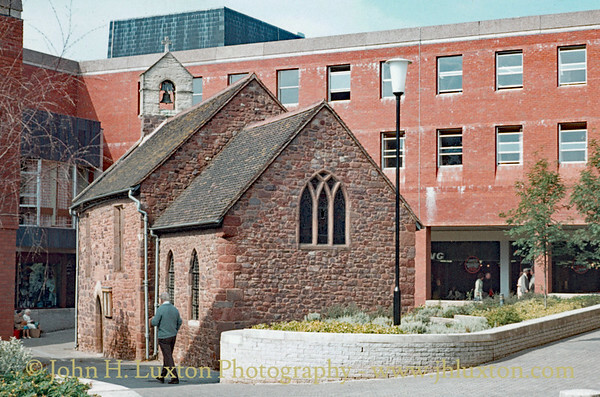 The Guildhall Shopping Centre, Exeter was constructed around the small St Pancras Church is a small church. The majority of the church dates from the thirteenth century, although the font is eleventh century. 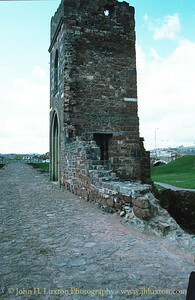 The church probably occupies the oldest Christian site in Exeter, and is usually open on weekdays. The church is designated by English Heritage as a Grade II* listed building. 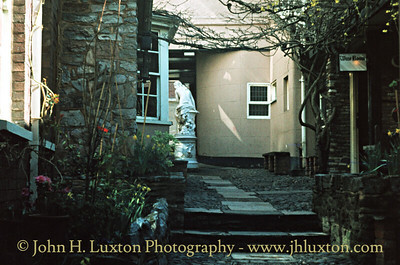 The court yard of the 14th Century White Hart Inn, South Street Exeter. 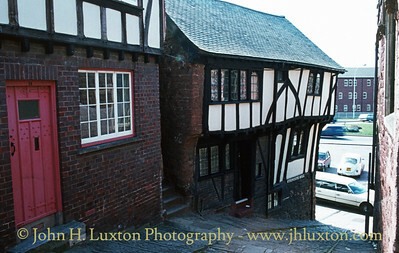 Believed to be the old Inn in Exeter. 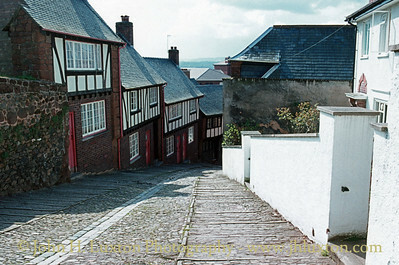 The original Princesshay was constructed in the early 1950s to replace buildings destroyed by enemy action. This view is taken looking south close to the Blueboy Gift Shop. 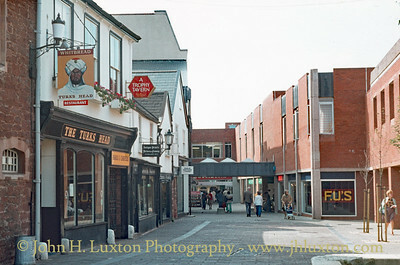 This popular shopping area which is believed to be the first pedestrianised shopping precinct in Britain was demolished and replaced by a new Princesshay Shopping Centre in the first decade of the 21st Century. The original Princesshay was constructed in the early 1950s to replace buildings destroyed by enemy action. This view is taken looking north close to the Chapter and Verse Book Shop. This popular shopping area which is believed to be the first pedestrianised shopping precinct in Britain was demolished and replaced by a new Princesshay Shopping Centre in the first decade of the 21st Century. Cathedral Yard Exeter. 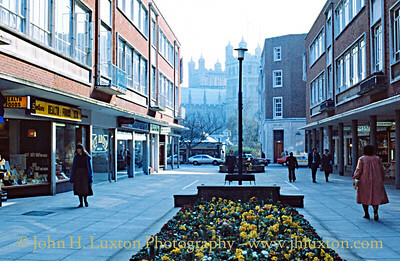 The Mansion House - 18 Cathedral Yard - in the centre of this photograph was the scene of the source of a fire on October 28, 2016 which spread through the adjoining Tudor building to the Royal Clarence Hotel just off the photo to the right. The building apart from its facade was. 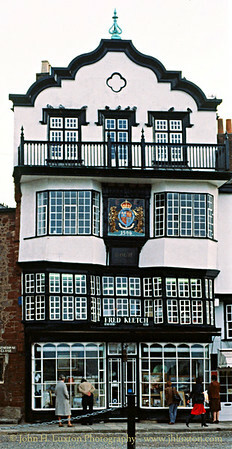 1 Cathedral Close, Exeter is better known as Mol's Coffee House - built in 1596. 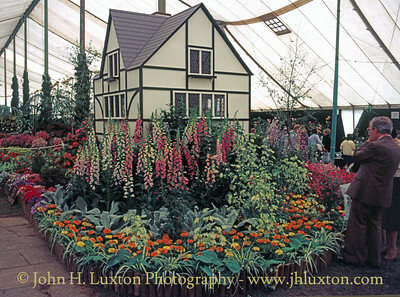 This prominent grade I listed building was trading as the Fred Keech Gallery in March 1981 when this photograph was taken. 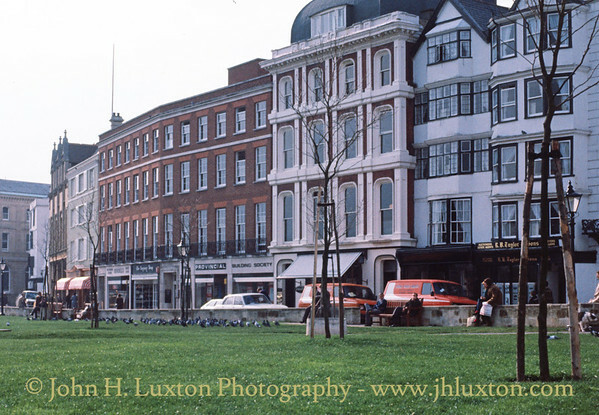 Fortunately, though located very close to the Royal Clarence Hotel the fire which destroyed the Mansion House and The Royal Clarence Hotel did not spread to this, probably the most famous building in Exeter. Cathedral Close, Exeter. 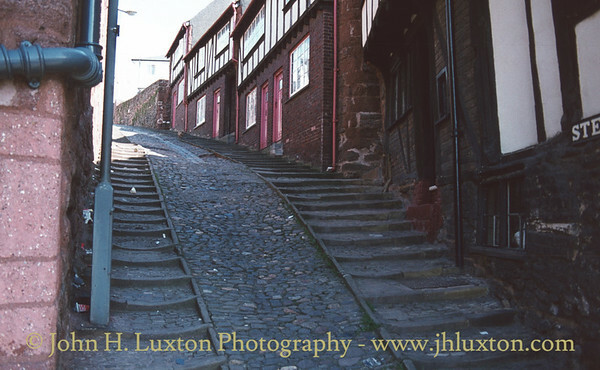 On the left can be seen Mol's Coffee House - built in 1596. 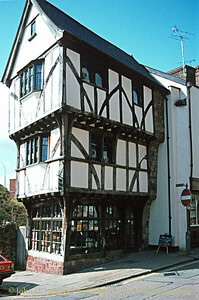 This prominent grade I listed building was trading as the Fred Keech Gallery in March 1981 when this photograph was taken. Fortunately, though located very close to the Royal Clarence Hotel the fire which destroyed the Mansion House and The Royal Clarence Hotel did not spread to this, probably the most famous building in Exeter. 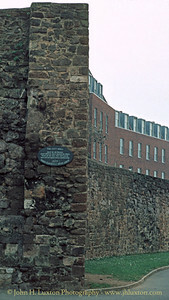 A section of the Exeter City Walls in Post Office Street. River Exe above the Exe Bridges at Exeter. The House That Moved - located near the bottom of Stepecote Hill this Tudor building had been transported to a new site to aid its conservation and redevelopment of its original site. 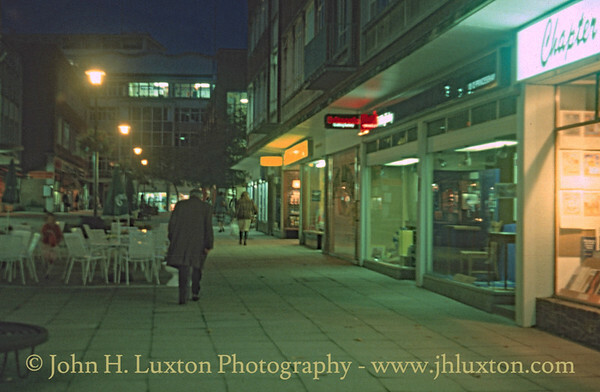 When photographed in 1982 the ground floor shop was a gemstone and mineral sample dealers. 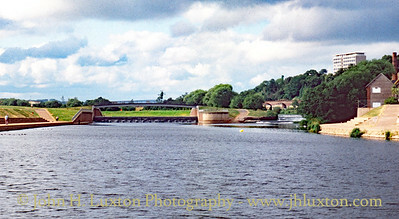 The River Exe at the Exe Bridges. 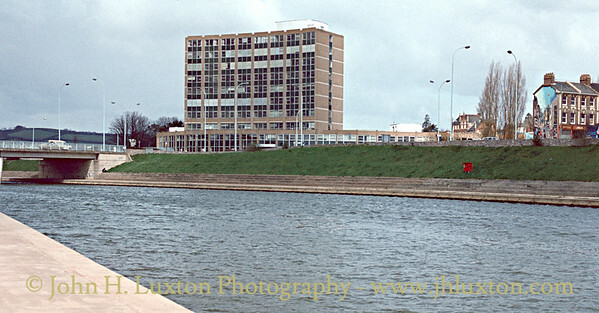 The bridges built at the start of the 1970s with their associated flood protection scheme form a large roundabout which is often congested. Before construction a single span bridge dating from 1905 crossed the Exe at this point. 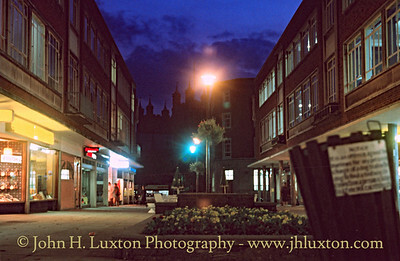 In the background can be seen Renslade House office block which some describe as the most ugly building in Exeter. 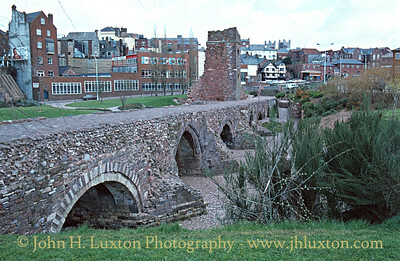 Photographed on March 29, 1982 the remains of the medieval Exe Bridge which form one of Exeter's most important historic monuments. The bridge was built about AD1200, when the river was much wider than it is today. Nine of the original 17 or 18 arches still stand, making this one of the most substantial survivals of Britain's early medieval bridges. The remains of St Edmund's Church also form part of the monument; the church was built as part of the bridge. Its tower was added in the 15th century and rebuilt in the 19th. The Remains of St Catharine's Alms Houses Exeter destroyed in a bombing raid during the WWII Blitz on Exeter.